One great approach to exercise can be to bump up the fun factor in your choice of physical activity. "Exercise should be fun," said Liz Walz, Fitness Coordinator at the University of North Carolina at Chapel Hill. 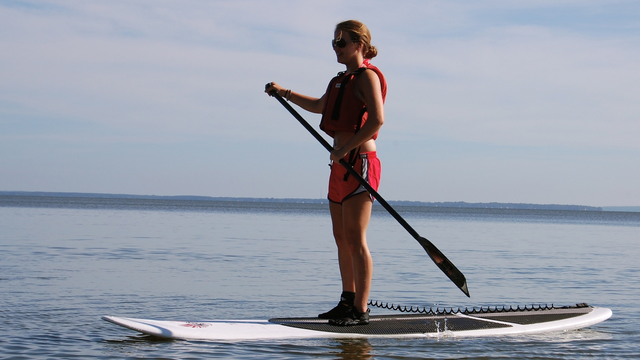 "Explore different ways of exercising, such as Stand-Up Paddling (SUP) to see what you enjoy." The activity involves standing on a paddle board and rowing with a paddle. It certainly looks fun, and apparently many people agree as SUP has grown in popularity over the last 5 years. In 2012, SUP had the highest percentage of new participants of any outdoor sport. "Stand-up Paddling is a low-impact sport and easy to learn," Walz said. "Most people are able to stand up and go very quickly." From a fitness perspective, Walz says the sport also offers a full-body workout that can help you develop core strength. "The core is the origin of all movements, which means that the core needs to be stabilized in order to create a strong base with your legs, keep your balance and develop the strength to paddle in the upper body and arms," Walz said. "Stand-up Paddling is a great way to increase core strength and build overall strength, stability and balance." If you want to get started, Walz recommends renting equipment from a local outfitter. "But if you truly enjoy it, I would recommend buying a paddle board, a paddle and a leash," Walz. "You can choose a leisurely paddle on a calm lake, host a social padding session with family and friends, fish from your stand up paddle board, or surf waves." The sport originated in Hawaii more than fifty years ago as an offshoot of surfing, but has grown to include paddle board yoga. "For an added challenge, I would recomment SUP yoga," Walz said. "Start with simple poses, such as child's pose or plank. You will be surprised how hard these "easy" poses are on a stand-up paddle board." In North Carolina, the Wrightsville Beach Museum will host its first SUP pro am event in April. Does the History of Paddle Start with our Genetic Code?